"A classic favorite is reincarnated as a pizza. 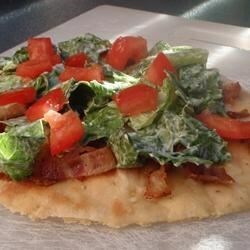 Bacon and tomatoes are baked onto a pizza crust then topped with a seasoned shredded lettuce to make an unforgettably fun meal." Preheat the oven to 375 degrees F (190 degrees C), or according to package directions for pizza dough. Place bacon in a heavy skillet over medium-high heat, and fry until browned, but not crisp. Drain on paper towels. Stretch pizza dough out over a pizza stone, pan, or cookie sheet. Brush the dough with olive oil. Spread the shredded mozzarella over the crust, and arrange the tomatoes over the cheese. Chop bacon, and sprinkle evenly over the pizza. Bake pizza for 10 to 15 minutes in the preheated oven, until the crust is golden and cheese is melted in the center. While the pizza is in the oven, toss the shredded lettuce with mayonnaise, and season lightly with salt and pepper. Top the finished pizza with the dressed lettuce, and serve immediately.